A unique and poignant exhibition of 5,000 ice sculptures is being staged this weekend. Roz Laws finds out how it's done. It is stunning art with a powerful message to melt the heart. But you have to be quick to catch it, because the work of Brazilian sculptor Nele Azevedo will be gone after an hour or so. All that will be left to show for two weeks of intensive work are puddles of water in Birmingham’s Chamberlain Square. But before they melt, 5,000 tiny ice sculptures of figures will be placed by the public on the steps to remember those men and women who made sacrifices in the First World War. It’s the first time Nele has presented her work in England, and by far the largest project she has undertaken, as she usually only makes 1,500 sculptures. They can be used to mean different things – in Berlin in 2009, they were part of work drawing attention to global warming. In Belfast, the figures represented those who died on the Titanic. In China she was asked how she saw the future of her project and she said she would like to present 5,000 figures in a major city she had never visited before. So now they are in Birmingham, as part of the commemoration of the First World War. Descendants of those who fought in the conflict, especially those who are not remembered on war memorials, will be asked to place a figure on the steps on Saturday at 1pm. Then the public can join in, helping to fill the wide steps in the square with thousands of the figures before they all melt. The sculptures will be driven up to the square early on Saturday morning in 10 chest freezers and plugged in on arrival. It has taken a fortnight to make them, with Nele supervising a team of 20 local volunteers. They have been diligently sculpting away in a disused warehouse in Hurst Street, aiming to make around 410 figures a day. When I visit, figures on a blackboard are keeping track and so far the total has reached 3,425. Nele is confident they will make at least 5,000 by Saturday. I helped to make one of them, and it’s harder than it looks. Water is placed in special moulds made out of recycled bottles, then frozen before being turned out. The sculptors have to wear a thermal glove beneath a rubber glove on the hand holding the figure. With a scalpel, you trim off the excess ice like scraping a vegetable, sculpting a hand and dividing the bent legs to let the figure sit down. They represent men and women and you can tell the difference – women have a smaller head and breasts. Then they are carefully wrapped in a plastic bag and put back in the freezer. One volunteer, an art graduate, says: “It’s very therapeutic actually, it feels quite zen to make figure after figure”. On the wall of the warehouse is a Brazilian flag next to an English one. There are also posters on the wall, including one saying ‘‘Nos amamos gelo!’’ which means ‘‘We love ice!’’ in Portuguese. Also ‘‘Birmingham guerra morto, vamos lembrar deles’’ which means ‘‘Birmingham war dead, we will remember them’’. Nele is just shy of 5ft tall, a little dynamo of energy. She is 63 but looks far from it. She was a civil service auditor in her native Sao Paulo before going to art school at 43. 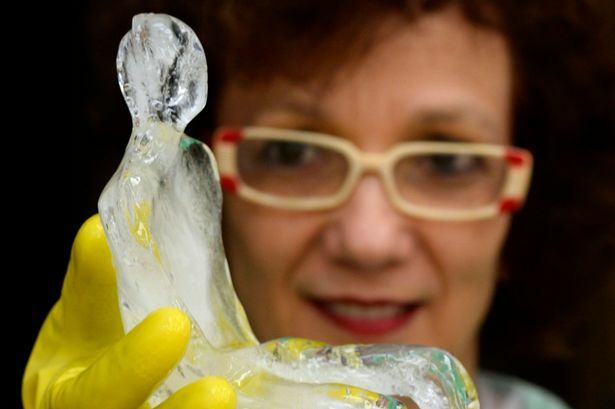 She came up with the idea of the ice sculptures for her master’s thesis. Nele says: “I wanted to break with the traditional characteristics of a monument. My sculptures remember people who are not remembered by other monuments. Nele has previously worked with iron but prefers ice – “it’s speedy!” she laughs. The Minimum Monument will also make a noise, as microphones will be frozen within some of the figures to make a soundscape of ice and water noises. Bringing Nele to Birmingham was the idea of the Hippodrome’s creative programme manager, Sarah Allen. She says: “I stumbled across Nele’s work on the internet and was blown away by it. “We wanted to work with an international artist on a contemporary work to commemorate the First World War and this seemed to fit perfectly. “It’s not just remembering soldiers, but also ordinary people and all those who contributed. “We have increased the scale considerably, partly because we need to fill the amphitheatre of Chamberlain Square. “Nele normally works with a team of four but this is the first time she has let local arts students help. “The biggest challenge will be getting the sculptures up to the square without them melting. We’re hoping for a cool day with no rain or wind, then the sculptures might last a couple of hours. “These ghostlike sculptures present a very powerful image, upon which people can place their First World War stories, almost like lighting a candle in a church. It’s a personal moment but shared with a lot of other people. “It’s a poignant, reflective exhibition.